When Did We Move Back To EUROPE??!?
. . . most of what's left at our front door goes straight to the trash (realtors' flyers, grocery-store circulars, and the occasional Spanish-language newspaper), but here was news we could use. 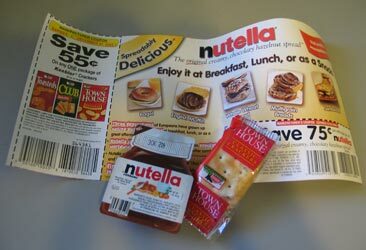 And to think that somebody went to the trouble to come up with this advertising campaign, print the bags and coupons, and leave this free sample in our average suburban neighborhood � obviously it's been decided that now is finally Nutella's time to shine in the American market. 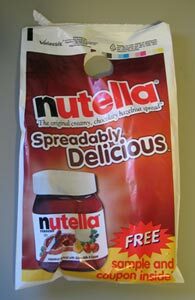 Only a few years ago, I can remember having to drive from supermarket to supermarket until I found the lone very special store that had jars of Nutella on the shelf. Maybe they'll have to translate das gro�e Nutella Kochbuch. What's next? Hanuta? Smarties (these Smarties, not those Smarties) in racks next to the checkout? Jars of Rote Gr�tze in the dessert aisle? Bring on the European grocery invasion!